The term “gig economy” made headlines all over in January when economists Lawrence F. Katz and Alan B. Krueger revoked their 2015 thesis on the topic. Although two economists making an incorrect assumption should never be surprising, the story caught the media’s attention and resurfaced ideas circulating about the state of this “gig economy.” In the economists’ defense, it is difficult to make predictions about the gig economy without a clear definition of what it entails. However, it is safe to say that the gig economy has become an important part of today’s workforce and will continue to be significant in upcoming years. The only new aspect of the gig economy is its name. 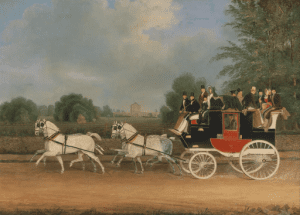 Before the 20th century, people typically worked multiple jobs to piece together an income. The one-career lifestyle is relatively novel. The first major “gig provider,” craigslist, was established in 1995 and was followed by similar companies like Elance (1998) and oDesk(2004). Access to the Internet and to mobile technology accelerated the use of gig work and continues to do so. Cell phones are an important technological advancement that has facilitated the rise of a new wave of gig workers across many fields. With almost every American now owning a cell phone with internet, accessing gig work opportunities is much easier in the United States than ever before. Now, 25 years after craigslist, apps like TaskRabbit, Lyft, Uber, Postmates, Airbnb, and others allow people to earn an income solely from the work. However, apps that facilitate task-like gig work are only considered a small segment of the gig economy and not solely used for replacing a 9-5 job. 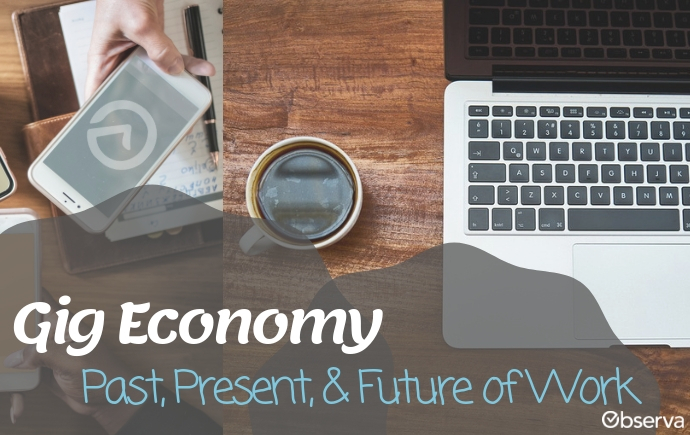 Defining the Present Gig Economy: Who Is Part of It? The difficulties in understanding the gig economy come from the challenge of defining what “gig work” is and who can be defined as a “gig worker.” While some people earn their income solely from gig work, others use it as supplemental income. Some freelance jobs involve highly technically skilled work and pay well, while others require nothing but a phone and pay minimally. Many workers choose to pursue this work, while others do it out of necessity. McKinsey broke down independent work into four categories: Free Agents, Casual Earners, Reluctants, and Financially Strapped. These categories outline how diverse the lifestyles and motives are for these types of workers. Although it is simple to categorize the motives and lifestyles of “gig workers”, determining what jobs are included in the gig economy is not agreed upon. Plenty of research has surfaced with conclusions on gig economy, but not all of them agree. This is because there are different definitions for who should be included in the research, making it difficult to come to any conclusions. The Federal Reserve’s 2017 Survey of Household Economics and Decisionmaking estimated that 31 percent of adults in the United States engaged in some form of gig work in the previous month. It is important to note, however, that these “gigs” included offline and possibly off-the-books activities like babysitting and housecleaning. Many people don’t consider tasks like babysitting or housecleaning to be gig work. Others don’t consider freelance engineering to be gig work either. Yet, plenty of surveys consider gig work to be any work outside of a 9-to-5 job. By this definition, the data leaves out the group of “Free Agents” defined by McKinsey. Due to these different understandings and definitions of gig work, obtaining consistent data about the breakdown of the gig economy can be extremely difficult. If It Isn’t Growing, Is It Shrinking? Before Katz and Krueger revoked their 2015 thesis, they asserted that the gig economy had grown over 10 percent in the last 10 years. But if their statement was untrue, and gig work isn’t making massive strides, is it just a fad that will eventually fade away? The Guardian: The ‘Gig Economy’ Is Coming. What Will It Mean for Work? In actuality, people were not quitting their full-time jobs to pursue this type of work. The gig economy is here to stay. Has it “revolutionized the way we work”? If freelance work is considered to be part of the gig economy, then the answer might be yes, as freelancing is becoming much more popular. More people are making the leap to do full-time freelance work than ever before. But if babysitting and housecleaning are considered to be part of the gig economy, then not much has changed in that segment. If you decide to look only at the “task” economy, including work on gig marketplace platforms, then the answer is that gig work has not fundamentally changed the way that we work to date, but it still could. Right now, more companies are providing opportunities for people to do this type of work, so there is growth in opportunity. However, people are not yet leaving their careers to live off of these opportunities; rather, they’re using these jobs for supplemental income. The demographics and motives of the task-oriented gig economy suggest that gig work is here to stay. There will always be people who want or need supplemental income due to short-term circumstances, such as the recent government shutdown, or to long-term issues, such as income instability or disabilities that interfere with working a 9-to-5 job. Even older generations are participating in gig work to keep themselves busy after retirement. By understanding the motives and lives of people completing gigs, it is easier to understand that there is a place in the economy for gigs to stay. With new companies providing gig work opportunities, as well as existing companies creating a space for this type of work, the widespread adoption and growth may not be far off. Still, it is important to understand that this does not mean massive groups of people will be quitting their 9-5 jobs. There will always be freelancers, casual earners, and people that are financially strapped that benefit from the gig economy; therefore, there will always be companies providing these gigs. 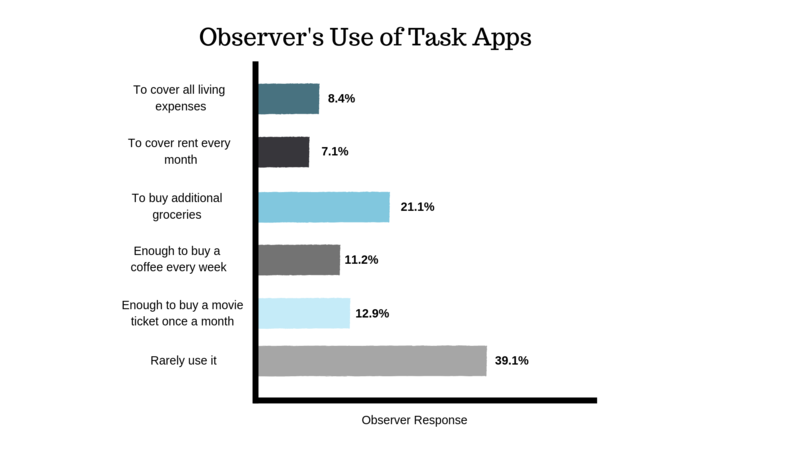 Out of curiosity, we polled our Observers to ask them why they use our app and, potentially, other similar apps. 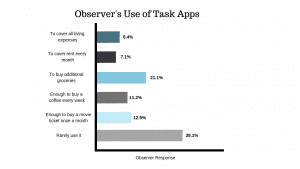 It is clear that a majority of Observers use these types of apps as supplemental income. Only 15.5 percent of Observers use these types of apps to pay for their entire rent or living expenses.